Przez tydzień 21-27 lipca 2013 Poznań gości około 50 badaczy teatru średniowiecznego. Zrzeszeni w towarzystwie naukowym Société Internationale pour l’étude du Théâtre Médiéval spotykają się co trzy lata w innym ośrodku akademickim, w USA, Kanadzie lub Europie. Tym razem „młodsza Europa” po raz pierwszy jest miejscem takiego spotkania. Nie udało się przygotować propozycji dla kongresu w Krakowie, i gremium odważnie przegłosowało kandydaturę Poznania (trzy lata temu na poprzednim kongresie w Giessen). Jak dotąd – piszę to po pierwszym dniu znakomitych referatów i długich dyskusji – nikt nie żałuje, a wszelkie wątpliwości znikną, kiedy zaczniemy jeszcze oglądać przedstawienia przywiezione na festiwalową część kongresu. Program można znaleźć na stronie kongresu. Jeden dzień spędzamy poza Poznaniem: Kórnik i Gniezno, tutaj część sesji i dwa przedstawienia. Wybieram z całego programu części widowiskowe dla lepszej widoczności, zwracając uwagę na dwa przedstawienia Everymana – kto nie widział tego arcydzieła średniowiecznego (ostatnio w Polsce realizował je Michał Zadara w Warszawie) – ma wreszcie okazję. 2. Carousing clergymen, angry peasants and a mocking city jester. A collage of bernense carnival plays The Archive Histrionics, Univeristät Bern (dir. Simone Gfeller and Heidy Greco-Kaufmann). Ten wpis został opublikowany w kategorii art, books, conferences, literature, medieval studies, research, theatre i oznaczony tagami Poznań, SITM. Dodaj zakładkę do bezpośredniego odnośnika. Jesteśmy tu mało cyfrowi, ale średniowiecza się trzymamy całkiem nieźle. 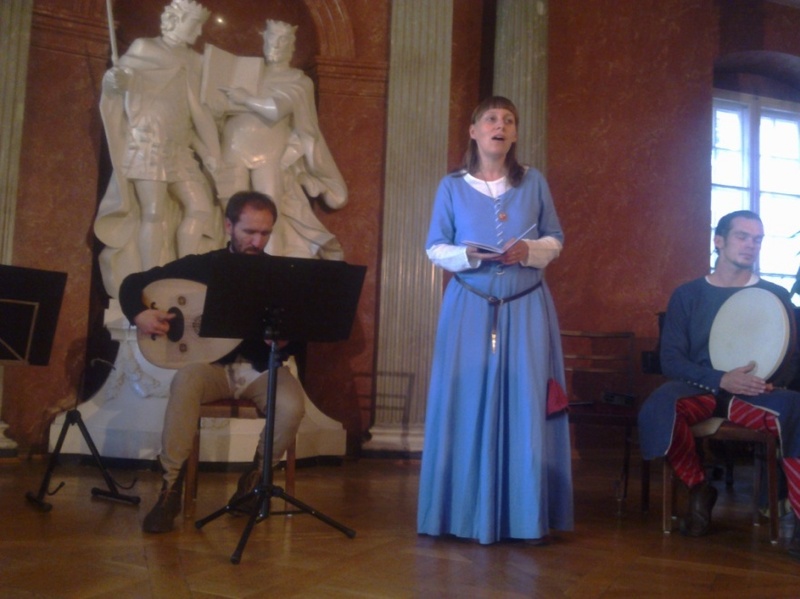 Niestety mam kłopoty z wyjściem z hotelowej sieci przez ftp na swój serwer żeby zainstalować zdjęcie z koncertu zespołu Scandicus, który w repertuarze trubadurów bardzo się spodobał, bisował, a potem jeszcze przy lampce wina po angielsku opowiadał to, co było śpiewane w polskich przekładach. The small amphitheatre of the Collegium Europaeum Gnesnense appeared an ideal place to stage the Everyman. Fortunately it is not only my opinion: congratulating the Director and the players I asked them about this space. What was remarkably in this excellently played performance is the experimental splitting of the main role. Everyman is subsequently being played by three actors, which is whether accidental nor necessary. Such necessity was explicitly addressed by Mikołaj of Wilkowiecko in the introduction to his History of the Glorious Resurrection, whose only preserved printed copy from short before 1600 we could see during the visit to the Kórnik Library (we read this passage together with Max Harris and Martin Walsh). Firstly, Crispin’s splitting of Everyman’s role is an immediate translation of the allegorical structure of this specific personage into the language of the theater: if the main figure is going to be understood as „everyman”, let it be represented by many at least. Such structuring (divisio) of the persona dramatis has another positive quality: it makes visible the change in the personage caused by its work with the task how to respond to the unexpected and feared summoning. But there is another advantage resulting from the director’s experiment. I don’t know if he is aware of it, but this clever step made some important contribution to the understanding of the function of allegorical medieval drama. The allegory opened the field for fictionality and brought about the danger of undermining the credibility of the plays. This danger seems to be understood by the authors of eschatological parts of the N-town-cycle (D. Mills in Revels history of Drama in English, 1983, p. 197.) To avoid this danger they created „ritual distance” between the audience and the action on stage, according to the pattern of the distance between the believers and God. Against this fictionalization danger different forms of de-theatralization have been invented: prayers, speeches, disputes, addresses (Mills 1983: 200); speaking against the concept of their role (cf. John the Baptist in Passion I of the N-town-cycle; Scherb 1995/1996: 482). In the Polish „Glorious Resurrection” we do also have a device of reducing the danger of fictionality: the Evangelist is addressing the audience and explaining his behavior on stage, why he is not reading from the Gospel (as he did earlier), but „from David and from the Creed” – which means focusing on the author’s decision for the rhetorical divisio of this „fourth part”. Philip Crispin in his Poznań staging of the „Everyman” discovered and proved efficient another „anti-fictional device”: the splitting of the allegorical role among more persons, and by force of it destroying the easy identification mechanism which is the main engine of the fictional effect (mimesis of Aristotle). This achievement is only in ascholarly sense an instance of de-theatralizaion, because actually it does the role work/speak for itself, independent form the human player. Independent, not without. In the margin of today’s discussion of Martin Bażil’s paper. „The scatological humor supports the themes from the negative standpoint by graphically displaying the state of the sinful soul and is thus thematically and structurally important, rather than merely a concession to an uneducated audience” (Castle 1990: 167). Castle D. R., The Diabolical Game to Win Man’s Soul. A Rhetorical and Structural Approach to „Mankind”, Peter Lang, New York etc. 1990. One hour ago today, professor Cora Dietl (Giessen) has been elected president of the International Society for the Study of Medieval Theatre SITM, with Lenke Kovacs as secretary/treasurer. National contacts of the SITM have been re-established. Next congress will be held in Hull and/or Durham.